Spring dinner parties have an air of elegance, the food is light and bright, to match the weather. Decorate your dining table with a blousy bouquet of elderflowers and serve several light courses to your dinner party guests. We’ve got plenty of spring recipes in our seasonal section – as your centrepiece, try a delicious Thai Green Curry. Spinach is a brilliant food and an equally wonderful crop. Some varieties are suitable for growing all year round. 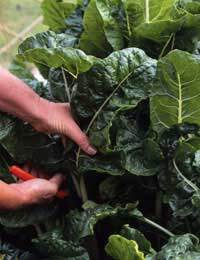 For an early spring harvest, sow spinach seed in September, while the soil is still warm. Although it grows slowly in colder weather, certain types of spinach can withstand frost, so you’ll be able to pick it right through the winter and spring. You’ll find baby spinach available from early spring – these tender leaves needn’t be stripped from their stems, and can be tossed into salads too. Foragers, this is the season to hunt for wild garlic and elderflowers. Wild garlic is usually found in woodlands – where you’d see bluebells in May – and gives off a strong scent that helps you to locate it! It has white flowers similar to leek flowers. Pick the young leaves from the plants: they can be eaten raw or chopped to bring fresh garlic flavour to any recipes that feature ordinary garlic, including our recipe below. For your dinner party dessert, simmer fresh gooseberries in elderflower syrup and serve folded through whipped cream, with crushed meringues, if you like. Elderflower syrup is very easy to make: boil the flower heads in plenty of water for twenty minutes, then strain the liquid and add 1.5kg sugar per litre of liquid, plus the juice of one or two lemons; boil again to reduce to a syrup. Did you know that seasonal eating dates back centuries? Historically, people have always eaten more in the colder months. Pre-central heating, the only way to stay warm during winter was to build up a little extra fat around your bones! So the progression from carb-rich roots and baked puddings to greens and lighter meals, as the weather warms up, is natural for our bodies, as well as for the earth. The recipe for Thai Green Curry, below, is a good example of lighter food that’s just perfect for spring dinner parties. This dinner party main course is easy to throw together. In a hot wok, warm the oil and throw in the onion and chicken. Stir until the chicken is seared, then stir in the curry paste, ginger, lemongrass (reserving the lime juice), spinach and peas. Stir for another minute before adding the coconut milk. Add the sugar and a splash of soy sauce, and simmer gently for 20 minutes, or until the sauce is thickened and the chicken is cooked. Taste and season with extra lemon juice, sugar, salt and pepper, if required. Stir in the herbs and serve.